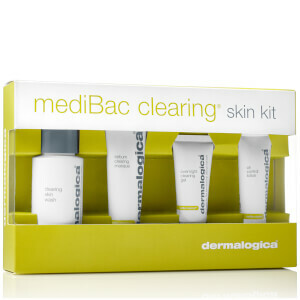 Step up your skincare regime with Dermalogica’s Limited Edition Meet Dermalogica Kit. Combining four travel-sized treatments, this set is an ideal introduction to the brand’s bestselling products recommended by skincare professionals and beauty experts worldwide. Suitable for all skin types, this effective starter kit reveals a cleansed, exfoliated, moisturized and pampered complexion. Formulated with natural Quillaja Saponaria, this soap and fragrance free cleanser is ideal for combination to normal skin types, foaming into a refreshing lather to effectively eliminate dirt and impurities without altering skin’s natural moisture levels. Enriched with calming extracts of Balm Mint and Lavender, skin is left feeling squeaky-clean and revitalized. This unique rice-based enzyme powder activates upon contact with water, releasing Papain, Salicylic Acid and Rice enzymes buff away dulling debris and impurities, leaving skin smoother and brighter. Formulated with a skin brightening complex of Aspergillus, Grapefruit and Liquorice, uneven skin pigmentation is balanced whilst Green Tea, Ginkgo and Colloidal Oatmeal help refresh and revitalize. Containing Lecithin and Aloe Gel, this moisturizing cream works to maintain skin’s natural moisture levels, with Cucumber and Arnica to soothe and hydrate, restoring tone and suppleness. Antioxidant-rich Grape Seed Extract and vitamins A,C & E all combat free radical damage and help shield skin from pollution and dehydration. Free from artificial fragrance or colors, skin is left softened and smooth. Designed specifically for the lip and eye area, this potent firming serum works to protect skin from environmental damage and improve texture while combating signs of premature aging. Infused with an antioxidant-rich cocktail of vitamins A, C and E, it works to stimulate skin’s natural repair process and defend against free radicals. The appearance of fine line appears reduced and skin feels softened and hydrated. 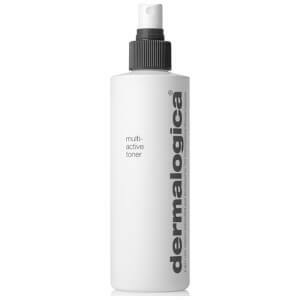 Cleansing Gel: Pump a small amount of cleanser into the palm of your hand. Gently work the gel into a deep cleansing lather and apply to your dampened face and throat. Rinse with warm water and repeat for professional cleansing results. Microfoliant: Dispense half a teaspoon of Daily Microfoliant into very wet hands and create a creamy paste by rubbing hands together. Apply to face in circular motions, avoiding the eye area. Massage gently for one minute, then rinse thoroughly. Smoothing Cream: After cleansing and toning, apply over your face and throat in light upward strokes. Use twice daily - morning and night. 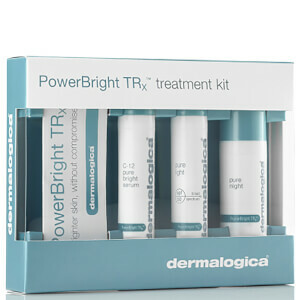 Power Firm: Smooth around your eyes and mouth, concentrating on areas of visible ageing. For optimum results, use morning and night after cleansing. Cleansing Gel: Water/Aqua/Eau, Sodium Laureth Sulfate, Disodium Lauroamphodiacetate, Sodium Trideceth Sulfate, Hexylene Glycol, Hydroxyethylcellulose, Lavandula Angustifolia (Lavender) Extract, Melissa Officinalis Leaf Extract, Quillaja Saponaria Bark Extract, Lavandula Angustifolia (Lavender) Oil, PPG-5-Ceteth-20, Citric Acid, Sodium Chloride, Phenoxyethanol, Methylparaben, Propylparaben. Microfoliant: Water/Aqua/Eau, Sodium Laureth Sulfate, Disodium Lauroamphodiacetate, Sodium Trideceth Sulfate, Hexylene Glycol, Hydroxyethylcellulose, Lavandula Angustifolia (Lavender) Extract, Melissa Officinalis Leaf Extract, Quillaja Saponaria Bark Extract, Lavandula Angustifolia (Lavender) Oil, PPG-5-Ceteth-20, Citric Acid, Sodium Chloride, Phenoxyethanol, Methylparaben, Propylparaben. Smoothing Cream: Water (Aqua), Butylene Glycol, Caprylic/Capric Triglyceride, Ethylhexyl Hydroxystearate, Stearic Acid, PEG-8, Lactamide MEA, Ethylhexyl Methoxycinnamate, Dimethicone, Cetearyl Alcohol, Silk Amino Acids, Polysorbate 60, Tocopheryl Acetate, Citrus Aurantium Amara (Bitter Orange) Flower Extract, Cananga Odorata Flower Oil, Camellia Oleifera Leaf Extract, Aloe Barbadensis Leaf Juice, Allantoin, Panthenol, Glycolipids, Sodium Hyaluronate, Palmitoyl Hydroxypropyltrimonium Amylopectin/Glycerin Crosspolymer, Lecithin, Vitis Vinifera (Grape) Seed Extract, Malva Sylvestris (Mallow) Flower/Leaf/Stem Extract, Hedera Helix (Ivy) Leaf/Stem Extract, Cucumis Sativus (Cucumber) Fruit Extract, Sambucus Nigra Flower Extract, Arnica Montana Flower Extract, Parietaria Officinalis Extract, Retinyl Palmitate, Ascorbyl Palmitate, Polyquaternium-10, Cetyl Alcohol, PEG-100 Stearate, Glyceryl Stearate, Aminomethyl Propanol, Disodium EDTA, Carbomer, Sodium Benzoate, Phenoxyethanol, Ethylhexylglycerin, Benzyl Benzoate, Benzyl Salicylate, Linalool. Power Firm: Cyclopentasiloxane, Bis-Diglyceryl Polyacyladipate-2, Dimethicone Crosspolymer, Cetyl Ethylhexanoate, Polyethylene, Tocopheryl Acetate, Camellia Sinensis (Green Tea) Leaf Extract, Chamomilla Recutita (Matricaria) Extract, Corallina Officinalis Extract, Carthamus Tinctorius (Safflower) Seed Oil, Vitis Vinifera (Grape) Seed Oil, Flavor, Ascorbic Acid, Glycyrrhetinic Acid, Boron Nitride, Retinyl Palmitate. Cleansing Gel: 1.7 fl. oz / Microfoliant: 0.5 oz / Smoothing Cream: 0.7 fl. oz / Power Firm: 0.2 fl. oz. Five stars! Got me into a great skincare routine and visibly made my skin look MUCH younger. I recommend this!